If you’re anything like me, whenever you receive a new TAMS Journal, you give it a quick leaf-through to see if there’s an article pertaining to one of your particular collecting interests. With this in mind, I have a feeling that if I submitted a general article about transit tokens, encased coins, casino chips, or political medals, I would probably be speaking to a large percentage of the readers because most of us have one or more of these familiar categories represented in our collections. But if instead I were to write about just one token, say, my good for 5¢ at Ye Old Café in deepest downtown, could I be assured of providing as meaningful a service or capturing a comparable level of interest? After all, many readers might not collect tokens from deepest downtown, or might just not have much interest in café good fors and probably don’t even have one from the Ye Old. But I just got one from A. B. McGill’s in deepest downtown Bertram. And while you may not have a token from this particular place or town, and you might not have much interest in Bertram (or even Texas), I bet you do have tokens from one or more of the many collecting roads that converge at McGill’s old general store. I’ve been on the prowl for Texas tokens for so long now that it seems a rare day that I can turn up something new that’s still within my budget. Imagine my great joy, then, when I ended up high bidder on this newby-to-me, “Good for 1.00” at McGill’s. I quickly set to work looking online for whatever I could find out about McGill’s because for me it is the very specific history of these little gems that makes them so appealing. I soon learned that the building is still standing and that some photos have even been posted on line. Knowing that Bertram is about 40 miles northwest of Austin, I decided to put it on my driving route for the next time I was headed south from my home near Dallas. The Internet is such a magical tool, and before long, I was able to assemble quite a bit of information about the building, the store, and the people who had owned and run it. But more than that, I also came to see that this particular token represents a whole broad category of tokens within the wider category of U.S. trade tokens. In so doing, it encapsulates a broad panorama of not just Texas history but U.S. history as well. As I would soon come to see, A.B. McGill’s was much like so many of the general stores that were once a central feature of almost every U.S. (and Canadian) town. Among many insights to be gained from this short summary is that the coming of the railroad was a pivotal event in the eventual establishment of McGill’s. The small group of residents wanted that railroad to come through South Gabriel so very much that they were willing to offer what must then have been an enormous sum! We can only assume that they believed a whistle stop would be not only very convenient but would also lead to growth and to certain prosperity. But the railroad company declined. One can only wonder why. Bertram is located in the very scenic and popular Texas Hill Country, which is primarily limestone and caliche (a sedimentary rock) with a thin covering of topsoil. The landscape varies from relatively flat to rolling hills, with many rock creek beds (usually dry) and plenty of steep rocky hills. It was once an ocean bottom, and it is a land that is slow to recover from change. The appearance of the Hill Country today is far different from the way it was described by the pioneers of the 1800’s. Today it is dominated by Live Oaks and especially a Texas-size weed we call “cedars” (Ashe junipers) – oh, and sprawling subdivisions radiating ever outward from Austin and San Antonio. And yet the biggest single factor affecting the land, from nature’s point of view, was the plowing of fields and the overgrazing of livestock in the late 1800’s. But I would bet that the railroad’s decision about where to lay its track was based on a very different view of the land – probably the costs of laying track in rocky and hilly terrain. So, the town of Bertram was formed as a stop on the new railroad and named for its largest stockholder; its primary industry was cotton, cattle, and wool; and it supported three general stores in 1891. Was McGill’s perhaps one of them? As we will see, that’s a yes and a no . Continuing to “let my fingers do the walking,” I found out that the Burnet [pronounced “Burn-it”] County Genealogical Society had three articles specifically relating to McGill’s. One was readable on line and two were available as photocopies on request. Within days, I had all three articles in hand. The earliest was written in 1992 when McGill’s was still a general store and still open for business. 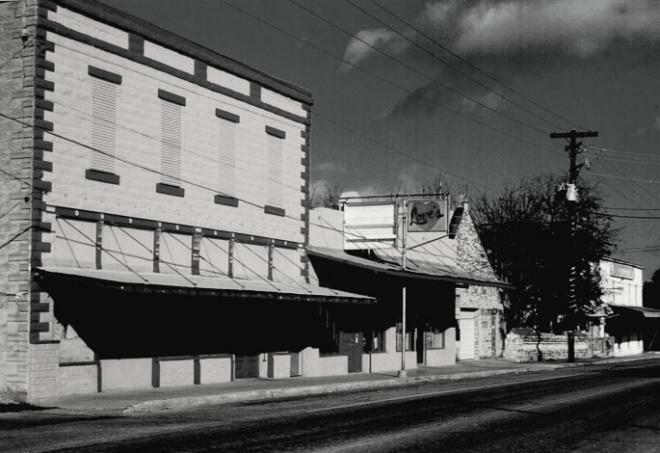 It began with a photo of the building, the heading, “McGills Dry Goods, Oldest store in all Burnet County,” and the photo caption, “McGill’s store in Bertram is a throwback to the old days when small-town mercantile stores ruled the rural Texas landscape.” 4 Could this be true? Did small town mercantiles really rule the landscape? My mind began to run in all directions. I began to think of the huge numbers of tokens that bear the inscriptions general store, mercantile, dry goods, general merchants, and general merchandise – not just in rural Texas but in nearly every state. And how many more tokens are from similar establishments that just didn’t include those particular words in whatever the owners had stamped on their tokens? We know that many of them just put denominations and names – good for 10¢ at Smith and Jones or 25¢ at Hoodoo and Hay’s – and many are “mavericks” that do not even mention the towns they were from. And then I remembered Love’s Store. 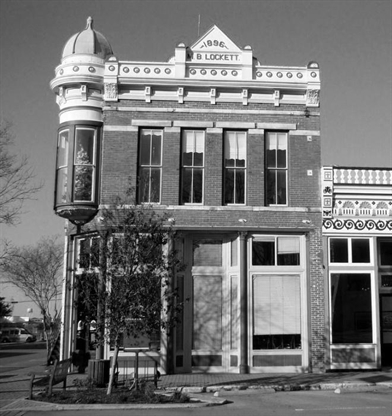 From 1990-93, I had the wonderful opportunity to experience small-town living in Center Point, Texas. This was also a Hill Country town – population about 600, about 50 miles northwest of San Antonio and a little over 100 south of Bertram. Still open for business through all the time I lived there was a true blue general store that I can only imagine was very much like McGill’s. I only wish I had taken more pictures and made an effort to capture what I did not realize at the time was the very end of an era for a major part of rural America. My continuing research led to a wealth of information from a variety of sources which, if not specifically referenced, will appear in this article’s end notes. I learned that Reed and McGill were brothers-in-law. D.C. Reed married Laura Moses, and A.B. (Archibald Brown) McGill married her sister, Clara. When McGill joined Reed, it was initially as an employee at an agreed salary of $100 a month. 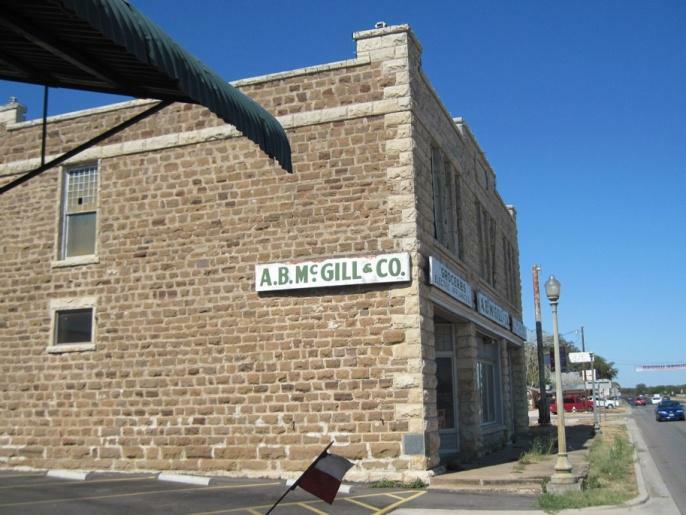 McGill had been in the mercantile business in nearby Burnet, working for another token-issuing establishment, the Badger-Johnson Co. McGill died in 1934, and Clara took over with the help of their two daughters until her own death in 1949. One of the daughters, Ada Reed, had become actively involved in 1939. When Clara died, Ada Reed and her husband, Bob Brewer, became the owners and continued to manage the store until Ada Reed’s death in 1991 and the store’s closing in 1993. I worked at McGills when I was in 10th grade in 1970-71 (I was 15), my first real job, making, I believe, 75 cents an hour. It was a wonderful store. The back door entrance led into the grocery section to the left (where you could get a cold Coke). Seems like the children's clothes were near the groceries and the office was to the right. As you came in the side door on the east, the office was on the left and to the right was the men's section. The front door on the left led into the shoe department. But my favorite section was the one entered through the right door. This section had beautiful, expensive glassware such as Lalique. In front of the glass cases were display cases full of glittering costume jewelry, big gaudy brooches being a specialty. You could also buy sewing notions, greeting cards, underwear to fit anyone in the family, nice dresses for women, and cool clothes for teens. As a teen who loved clothes, I always had something on layaway and usually spent my entire paycheck in the store. One Christmas, I saved enough to buy my mom a piece of Lalique. The store absolutely fascinated me. Along with the new clothes there was also merchandise that had been there for 10 or more years. For instance, under some of the counters there were some boys’ shirts, in “as new” condition, still in their cellophane-type wrap that had to be from the ’60s or ’50s. Some of the greeting cards and buttons were relics too, but I thought it was great. I enjoyed helping the older women find and try on dresses – I was at their beck and call as customer service was the #1 duty. Bob and Ada Reed Brewer owned the store. Mrs. Brewer acquired it from her family. She did all of the buying and would make trips to the market in Dallas.…Two nice ladies who worked there and had worked there for years seemed absolutely ancient to me. I think their names were Nan and Lila. We rang sales up on an old fashioned cash register with the big round buttons that made a ka-ching type sound when you opened it. It was great…. McGill's is one of my favorite memories of that place and time. How fitting was her description with what I remembered of Love’s Store in Center Point. So, Ada Reed and her husband got McGill’s from her parents, who had gotten it from a D.C. Reed. What could I learn about him? My research continued with exciting results. 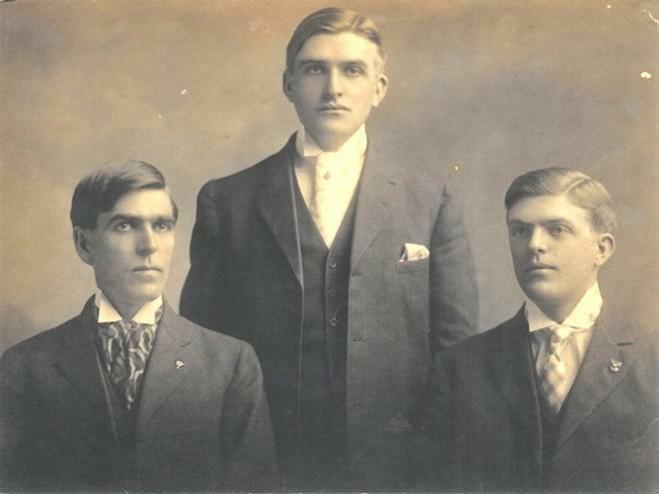 Born in 1883, David Cleveland Reed began in the mercantile business in his father’s general store, which became T.S. Reed and Son. T.S. (Thomas Seldon) Reed and his family had been part of the move from South Gabriel to the new Bertram in 1882, just a year before D.C.’s birth. T.S. sold the business to son David for about $22,000 in 1904, having already moved to Beaumont where he had established the T.S. Reed (wholesale) Grocery Co. 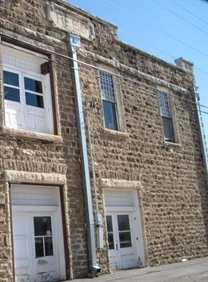 Thus, when David took over the business in Bertram, the general store was already perhaps 22 years old, and in 1905, he built the new building that would later house McGill’s. 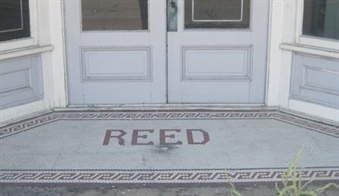 This explains why it is Reed and not McGill that is etched in stone at the top of the building and set in tiles in the entryway. 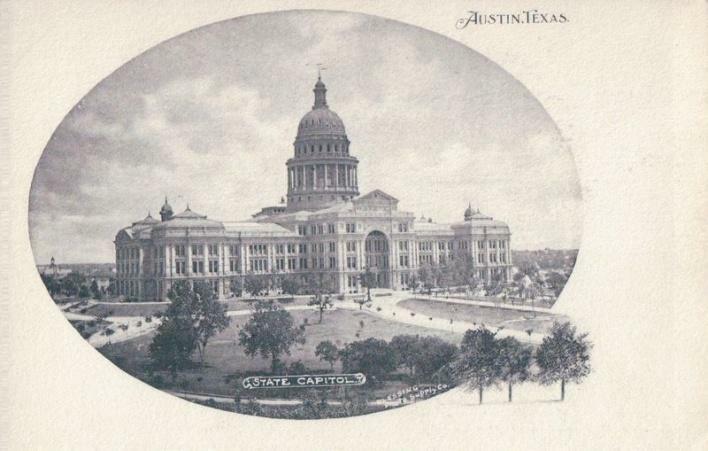 D.C. moved to Austin in 1914. There he became a very prominent civic leader, a true business tycoon, a partner in the famous Driskell Hotel, and the owner of a mansion known today as the Byrne-Reed House. 6 He died tragically in a small plane crash in 1948, and a lawsuit documents the battle over insurance premiums to be paid to his beneficiary. As a side note, many businesses of interest to collectors are preserved in the legal record, having often been involved in lawsuits that also, in a real sense, made history. I was able to make Bertram a stop on a trip to Austin in October, 2011. I took lots of pictures, including those shown here. A broken window allowed me to take pictures of the inside, but I was not able to actually go in. So, in answer to my question: yes, McGill’s was one of the three mercantiles in Bertram in 1891, but not yet in that building and not yet as McGill’s. And now it was clear that even T.S. Reed & Son was not the beginning of this very old establishment; it was itself the product of an even earlier establishment, M.B. Lockett’s, of which I hoped to learn more. As I neared what I thought would be the end of my research into a $1.00 token that had already paid great dividends in historical insights, I stumbled upon the find of a lifetime, at least as far as McGill’s was concerned. It was a reference to an oral history of Ada Reed McGill Brewer and her husband, Bob. Incredible! It seemed that someone had had the wisdom and foresight to record the recollections of the people who had actually owned and run the store for half a century. A little more online digging revealed that I could order a transcription for $15 from the Oral History Program of the University of North Texas in Denton. Now, what quickly turned this unfolding drama into a bit of a comedy was when my oral history packet arrived a few days later. Attached to the back of the 100-page transcript were associated appendices, including copies of key letters, a detailed advertisement from 1898, several newspaper articles, and (are you ready for this?) a February 1983 TAMS article on this very same subject! It was written by the venerable and late William Fowler, who contributed enormously to the cataloguing of Texas trade tokens. It seems that T.S. Reed’s older son, Malcolm (1876-1945), also ran a general store. His was at 3 rd and Main in Marble Falls and issued trade tokens under “M. H. Reed & Co.” Malcolm also appears in the family photo shown earlier. Another Reed token was issued by the banking and mercantile establishment of Potts-Connell & Reed in nearby Liberty Hills, 10 miles east of Bertram. 10 Which Reed that was is not yet clear. Five-cent calico, cracker barrels, buggy whips and bulk brown sugar are gone. But bottles of Garrett’s snuff are still there, along with frozen dinners, electric blankets and chic ensembles for mademoiselle….The visitor can roll away the years and visualize grandma’s girlhood in the same two-story stone building. So then, the first McGill’s was not a Reed store at all! It originated about 1865 with M.B. Lockett’s general store in the now vanished community of Cedar Mills. It then moved with Lockett to South Gabriel about 1871 and then, still as Lockett’s, to Bertram in 1882. In 1888, Lockett sold it to T.S. Reed, who as we know sold it to his son in 1904. It then moved into new quarters in 1905 where it became McGill’s in 1920 and remained so until it closed in 1993. 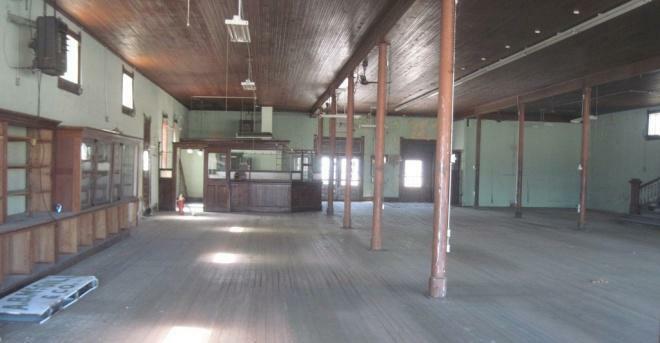 The building continued as an antique store until 1997 but has been vacant ever since. Space permits sharing only a few of the most salient findings from the oral history and its attachments. How wonderful that all are available as a permanent record through the Oral History Program of the University of North Texas for all who might be interested in further details. 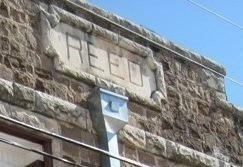 Apparently the first Reed store in Bertram was built with stones from the South Gabriel school building. It stood one door east of the present location, in the smaller building shown at left in the first of my photos of McGill’s (with the water tower behind it). Ada Reed said it was used like an outlet store for special sales until a truck slid into it and knocked off a corner about 1978. The building is a barbecue establishment now. Mr. Thurlow Weed in Austin did the embalming, and we carried the caskets and did all of the services and everything. We had a hearse….We used to cover the boards they lined the grave with. I helped cover these with a little tack hammer and these little carpet tacks.…That kept the dirt from falling into the grave…because this is caliche. I think now of all the history McGill’s represents, and of how much change Ada Reed and Bob Brewer must have seen. No doubt change is the one great and predictable constant. The coming or leaving of the railroad must have made or broken how many communities? Changing markets must have made or cost how many their fortunes in the days when cotton or some other commodity “was king”? Man’s ranching and farming has forever changed how many landscapes? The coming of electricity, refrigeration, good roads and bridges, population growth, air travel, the various wars…all witnessed by the Brewer’s during their tenure at McGill’s. But “time waits for no man,” and we, too, are living a history that is now being written. I wonder what the collectors of tomorrow will make of our coins, watches, pocket knives, iPhones, and whatever else they deem to be of value. It is said that energy is never created or lost but only changes form. It’s an interesting parallel. Towards the end of their oral history interview, the Brewer’s were asked about the future and what they saw for McGill’s general store. Ada Reed replied, “When we are gone, that is the end of the store.” Indeed, the general stores as the Locketts, Reeds, McGills, and Brewers knew them are gone now. The buildings may stand but not as they were. Where then do we go now for our hats and our mousetraps and jewelry and tools? In that must be the general store where we shop today. The author most gratefully acknowledges the contributions of all who have added so much meaning to just one little token from just one general store in just one small town, yet representing so much of life in another time. 1 Vivian Elizabeth Smyrl, “South Gabriel, TX,” Handbook of Texas Online ( http://www.tshaonline.org/handbook/ online/articles/hrsdc ), accessed January 31, 2012. Published by the Texas State Historical Association. 2 George C. Werner, “Austin and Northwestern Railroad,” Handbook of Texas Online, Ibid. 3 Tommye Dorbandt Potts, “Bertram, TX,” Handbook of Texas Online. Ibid. 4 Article from unknown newspaper, ca 1992, by Rachel Bryson McAllister, Burnet County Genealogical Society archives. 5 Unknown newspaper [probably River Cities Tribune], 2 November, 2008; “The Tale of A. B. McGill & Company” by Rachel Bryson. 8 Fowler, William, “A Hundred Years to the Day,” TAMS Journal Feb. 1983, pp. 28-30. 9 Appendices of a 1984 interview with Ada Reed Brewer and R.E. (Bob) Brewer, North Texas State University Oral History Collection, Number 90. TAMS Journal of the Token and Medal Society. It is copyrighted Nicholas Martin 2014, and is reprinted here in its entirety with permission of the author.